Ultimately, the goal of most content marketing campaigns is email address capture. When a reader decides to receive content consistently via email, a content marketer knows they’re developing a deeper relationship with that person. Whether the marketers selling software or venture capital, retaining an email address is a victory. In the last 18 months, this blog has grown its email subscriber list from zero to roughly 8000 subscribers, and lost about 1000, meaning the current distribution list is about 7k. Over the weekend, I tried to understand the general behavior of unsubscribes. The chart above that over the last 18 months, 1064 people have unsubscribed. 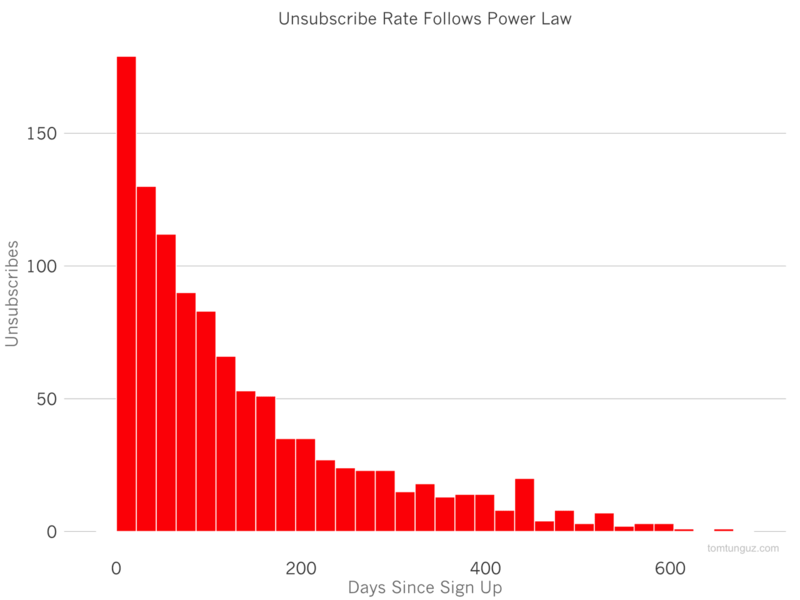 24% unsubscribe within the first 30 days, 40% within the first 60 days, 50% within the first 90 days. I’m not sure why people unsubscribe within the first 90 days, but it’s probably worth surveying them to get a better sense of the cause. If you have a point of view, please let me know on Twitter. Interestingly, there’s no correlation between the day of the week and a number of unsubscribes. 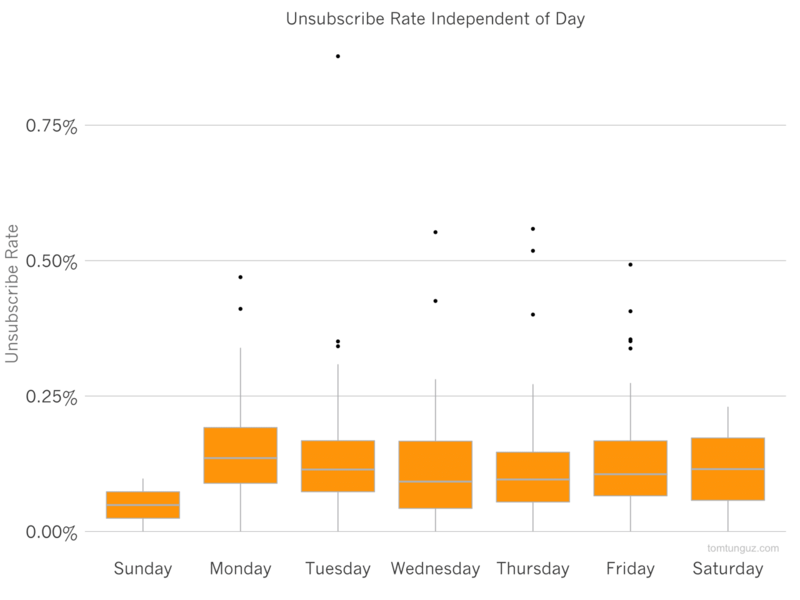 Sunday has a much smaller unsubscribe rate, but that simply because the data set is much smaller. I don’t write on Sundays. Note, the unsubscribe rate here is a campaign rate – meaning the number of people who receive an email from a blog post and choose to unsubscribe. 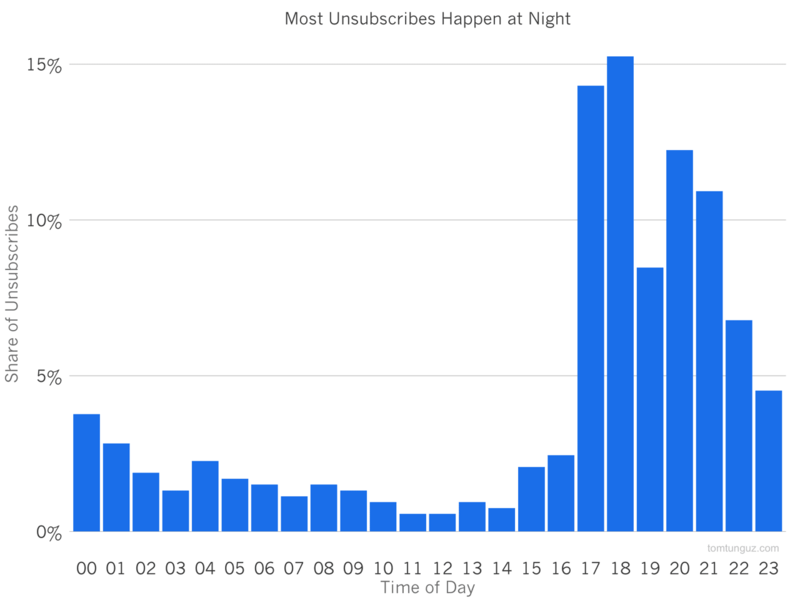 However, time of day is a huge factor in unsubscribe behaviors. 66% of unsubscribes occur between 5 and 10PM. Perhaps this is the time we’re all cleaning up our email inboxes and opting out of the content that isn’t useful for us. If nothing else, it’s a good reminder that sending emails out in the morning is likely a better time than late in the day. The next step in this analysis is to understand the particular details of blog post content that trigger unsubscribes. If you have thoughts on how to improve this blog and its email newsletter, please send me an email at ttunguz@redpoint.com or a tweet at @ttunguz. I’d really appreciate it.